Tokyo, March 24, 2016 – Fuji Heavy Industries Ltd. (FHI), the manufacturer of Subaru automobiles, has unveiled the all-new Impreza (North American specifications) at the 2016 New York International Auto Show. The fifth-generation Impreza is the first strategic offering under the company’s Prominence 2020*1 mid-term management vision. This model employs the completely revamped Subaru Global Platform architecture for the first time, significantly enhancing the body and chassis rigidity and strength. The Impreza also offers world-class collision safety and hazard avoidance performance, as well as far more driver-responsive handling and ride comfort. The new Subaru Global Platform, together with Subaru’s core technologies such as the newly developed 2.0-liter direct injection Boxer engine, Symmetrical All-Wheel Drive (AWD), and EyeSight driver assist system, represents a major advance in Subaru’s delivery of “enjoyment and peace of mind” for customers as the foundation of the next generation of Subaru vehicles. 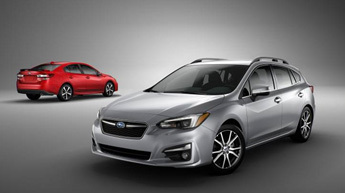 The Impreza is the first production model to fully incorporate the company’s DYNAMIC x SOLID design philosophy. It also features a greatly enhanced interior and exterior finish as a next-generation C segment model that far surpasses its class. The company plans to switch production for the North American Impreza from Japan to the United States*2, with the first units rolling off the line in late 2016. The all-new Impreza further enhances its functionalities while fully incorporating the company’s DYNAMIC x SOLID design philosophy as the first production model. It also features a high-quality interior and exterior finish. The rear combination lights sharing the same motif as the headlights express a Wide & Low stance similar to the front. The sedan body’s sleek styling from cabin toward trunk lid enhances the sporty impression. On the 5-Door body, a tightened cabin through the rear combination lamps and powerful looking shoulder silhouette enhance the sporty impression of the nimble 5-Door style. The spacious design flows from the instrument panel through the door trim for a feeling of refinement. The seats’ structures that are made more fitting to the bodies of passengers have been revamped to far surpass the quality of its class. In the center of the instrument panel is an 8.0-inch touch-screen display for the infotainment system, which can connect with Apple CarPlayTM, Android AutoTM, and other setups. Detailed stitching on the instrument panel complements the quality feel. In addition to the enhanced interior design, signature Subaru functionalities have been further strengthend inluding the excellent all-round visibility, spacious cabin, and cargo room. The new Impreza incorporated a number of improvements to achieve enhanced dynamic feel such as a secure and comfortable feel for the driver. Based on the thorough and precise analysis of the steering and pedal feedback, vehicle behavior, vibration and noise, and other elements that driver senses, the setup realize a dynamic quality that far surpasses its class as befitting this first in a new generation of the Subaru lineup. The new platform dramatically increases rigidity throughout the body and chassis (a 70% to 100% increase over present models) and incorporates substantial improvements to the suspension system and achieve a lower center of gravity, bringing about highly responsive steering that allows drivers to control the vehicle precisely as they want. The eradication of unnecessary movement in handling offers superior straight-line stability and cornering performance to grip the road surface. The new platform increases the rigidity of the suspension mounting, improving the absorption of the suspension without warping the body of the car, and providing a smooth and comfortable drive. By mounting the rear stabilizer directly to the body, the new platform reduces the body roll of the vehicle by 50% compared to present models. Around 80% of the parts on the FB 2.0-liter direct-injection Boxer engine employed on the new Impreza have been completely revamped compared with previous naturally aspirated engines, making the new eingine lighter to deliver more power and fuel economy. The improved Lineartronic greatly enhances ratio coverage and lightness to boost acceleration performance and fuel economy. 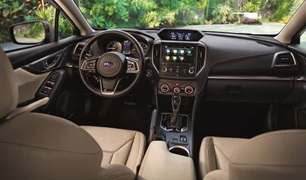 As well as employing full auto-step shift control, the Impreza features a 7-speed manual mode function that allows the driver to accelerate as desired. Noise and vibration are greatly reduced on both the engine and transmission, for more pleasant sounds and a dynamic feel. Subaru’s safety performance has continuously been highly rated by third-party organizations. The new Impreza has adopted technologies to further enhance its safety including the new platform and the advanced preventive safety system. The new platform achieves a center of gravity that is 5 mm lower than present models. Together with the major improvements in rigidity and the evolution of the suspension system, this lower center of gravity offers outstanding hazard avoidance capabilities on a level with a high-performance sports car. Thanks to a frame structure that enables more efficient energy absorption in the event of collision and the enhanced body strength resulting from the increased use of high-tensile steel plates including materials formed by the hot press method, impact energy absorption is improved by 40% over present models. The new High Beam Assist employs an EyeSight stereo camera, automatically switching from high to low beam according to what is happening ahead of the vehicle. Steering Responsive Headlights moves the beam right or left when turning at corners and intersections to illuminate the direction of travel. The Impreza employs the two headlight controls for the first time, dramatically improving nighttime visibility and recognition capabilities of EyeSight. The Impreza has newly adopted an automatic braking system for reversing. When the vehicle is reversing, a sensor inside the rear bumper detects obstacles and alerts the driver for possible collisions. If that driver fails to act, the system automatically brakes to prevent a collision or reduce damage. The Impreza newly employs blind spot detection and reversing assistance to enhance all-round preventive safety.